It would have been considered an extraordinary opportunity for a company so young, only in its first season, to perform works by the great dancer and choreographer José Limón. For that honor to be handed to some small burgeoning company in Utah was unimaginable—yet, in 1967, the unthinkable happened for Repertory Dance Theater (RDT). Those who were a part of it still remember. "The whole idea, that we were performing a piece by Limón, was amazing to the young dancers in the group," says Linda Smith, artistic director of RDT and one of the company's original dancers. "We felt humbled by the honor and knew that we had to achieve a high level of excellence to do his work justice." Now, 50 years later, at the closing of the company's anniversary season, RDT dancers will again perform Limón's work, which is still considered pivotal in the history and canon of modern dance. 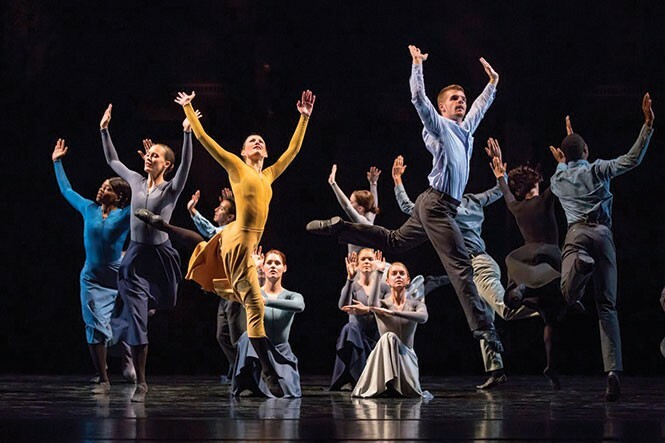 For their spring concert, Revere, the company will devote the entire program to two of José Limón's works: Missa Brevis and Mazurka. Born in Culiacán, Mexico, in 1908, Limón, while still very young, immigrated to Los Angeles with his family to escape the upheaval of the Mexican Revolution. Young Limón grew up surrounded by art (his father was a painter), and his initial forays into creative expression were through painting and drawing. While studying visual art in college, he moved to New York City, where he met modern dance pioneer Doris Humphrey. Soon after, he began performing in the Humphrey-Weidman Co. and choreographing works of his own. During World War II, Limón was drafted into the Special Services and served stateside entertaining the troops preparing to go overseas. It was only after the war—in the 1950s, when he served as a cultural ambassador for the United States—that Limón saw firsthand the devastation wrought by the war. Limón was particularly affected by a tour through Poland, an experience from which he drew inspiration for Missa Brevis and Mazurka, both choreographed in 1958. Limón's particular movement style, with its use of theatrical gesture and its surrender to both gravity and breath, is particularly effective in conveying emotional themes like those of war and loss, but also hope and rebuilding. Missa Brevis and Mazurka reflect both the horror that Limón felt seeing the trauma of the war's aftermath, and the strength he witnessed in the communities that were rebuilding. Contrasted against each other, Mazurka is often considered the lighter, more uplifting of the two. It's folkloric at times, and created as a series of smaller work—solos, duets, trios, quartets and ensemble pieces. Missa Brevis, unlike its sister piece, is a true Limón opus, a monumental work featuring 22 dancers; RDT's eight company members will be augmented by dancers from the University of Utah. It is a piece that emphasizes the toll of war, an emotional and spiritual work made even more poignant by the musical score, the mass Missa Brevis in Tempore Belli, which will be performed live by organist Brian Mathias and the Salt Lake Vocal Artists under the direction of conductor Brady R. Allred. Written by Hungarian composer Zoltan Kodaly, the mass—translated to English as "a short mass in time of war"—was scored during the siege of Budapest, and serves as a memento to the cities lost, as well as a tribute to those who rose up after the destruction. "For many people who know Limón's work, Missa Brevis and Mazurka stand out because they speak so strongly of human hope," says former Limón Company dancer Nina Watts. "His ability to look at the same events and approach them from such different points of view shows the greatness of his talent." Watts, who was once called "the perfect Limón dancer," is now one of the company's handful of "reconstructors" entrusted with taking Limón's work to dance companies around the world, setting the steps and fine tuning the quality of movement in the bodies of dancers. For three weeks in March, Watts worked intensively with RDT's dancers to perfect their understanding and performance of Missa Brevis and Mazurka. Watts has trained RDT dancers numerous other times over the years in Limón technique and set other Limón works for the company.